Here's everything for these savory bacon corn hushpuppies and the sweet and spicy honey sriracha dipping sauce. We like to use a deep fryer set at between 350 and 375 degrees Farhenheit, but it also works to use a deep pan or a cast iron pot and fill it a few inches or peanut or canola oil. Then, just heat it over medium-high heat until it reaches 375 degrees Fahrenheit. 1. In a small bowl, combine the cornmeal mix, flour, sugar and salt. 2. In a medium bowl, whisk together the creamed corn, yellow corn, sour cream, and egg. Add in the chopped bacon and green chilies stirring gently until just combined. 3. Whisk in your dry ingredients until smooth. 4. Prepare a baking sheet with paper towels, then top with a cooling rack (if you have one). This is where your hushpuppies will drain. 5. Using two spoons or a metal trigger ice cream scoop, carefully lower 5 to 6 dollops of batter into the hot oil, one at a time. 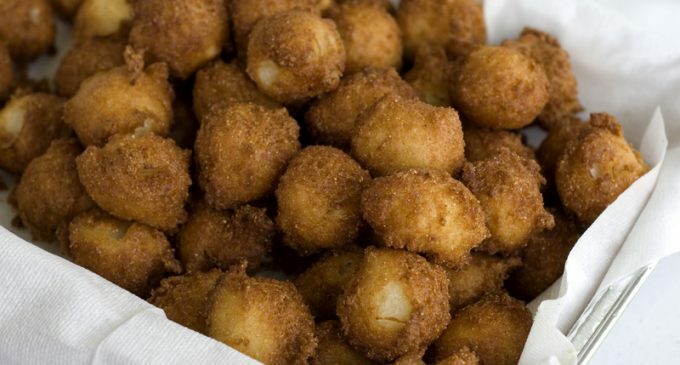 Cook, flipping occasionally, until the hush puppies are a deep golden brown, approximately 3 minutes. Remove with a slotted spoon and place onto the prepared baking sheet. 6. Continue with the remaining batter, returning the oil to 375 degrees F in between batches. Next, make the sauce. To do this, start by whisking all of the ingredients together until they're thoroughly blended. Customize the sauce to get the preferred level of spiciness. We recommend 3 tbsp. of sriracha and 1/2 tbsp. of cayenne for a sauce that's medium-spicy. Add more or less to turn the heat up or down. If it turns out too spicy, just add a little more buttermilk and honey to tone it down. We also recommend refrigerating the sauce so that the spices and sugars blend together really well, but this is optional. These bacon corn hushpuppies sound delicious, and that amazing honey sriracha dipping sauce just makes them even better- This treat makes a perfect appetizer, which is why we like to serve it at all of our gatherings.